It was my first month at Bozell/NY and probably Ron’s third month since moving from Minneapolis. My partner, award-winning copywriter Mike LaMonica, and I had just shared (with Ron’s blessing) a new campaign for SEVENTEEN magazine with the Account team. Shell-shocked, we went to Ron’s office. Not to whine. Just as an FYI. Ron sat silent as we filled him in. Then he asked for a copy of the copy strategy brief. He stared at it for what seemed like an abnormally long time. He took off his glasses—probably for dramatic effect—and said, “I’m looking at the Target Audience. Then for the first and only time I ever witnessed, he got mad. “I didn’t uproot my family and move to NY to shovel $#*!. “(Insert name of top account person) can’t make me shovel $#*!. “Even Chuck Peebler (Bozell CEO) can’t make me shovel $#*!. During my four-year stint at Bozell/NY, a sensational Strategic/Creative collaborative culture blossomed and flourished. No doubt Ron had something to do with it. Editor’s Note: Never underestimate the value of a tightly-defined strategy. 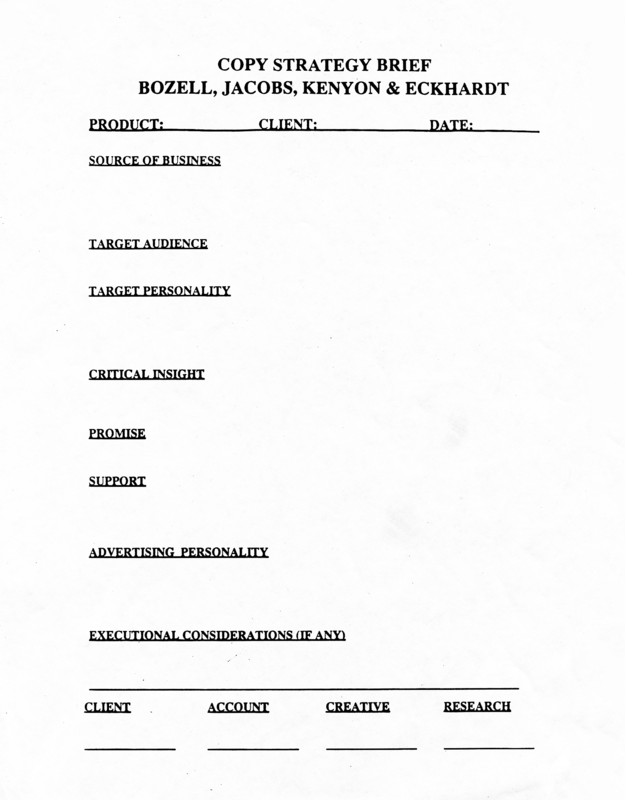 For a blank copy of the creative brief Ron helped author—plus instructions on how to use it—click Copy Strategy Briefs.